Sleeps 6-7. 3 bedroom villa with 3 bathrooms, bbq & outside shower. On beach. On the beach of Santa Maria, 50m to the sea! Beautifully furnished luxury Villa sleeps 6, 3 x double rooms. The most stunning views & tranquil location on the island. Truly unique. Air conditioning available at 15 euros per day. WiFi available at a small charge. The calendar is regularly updated. 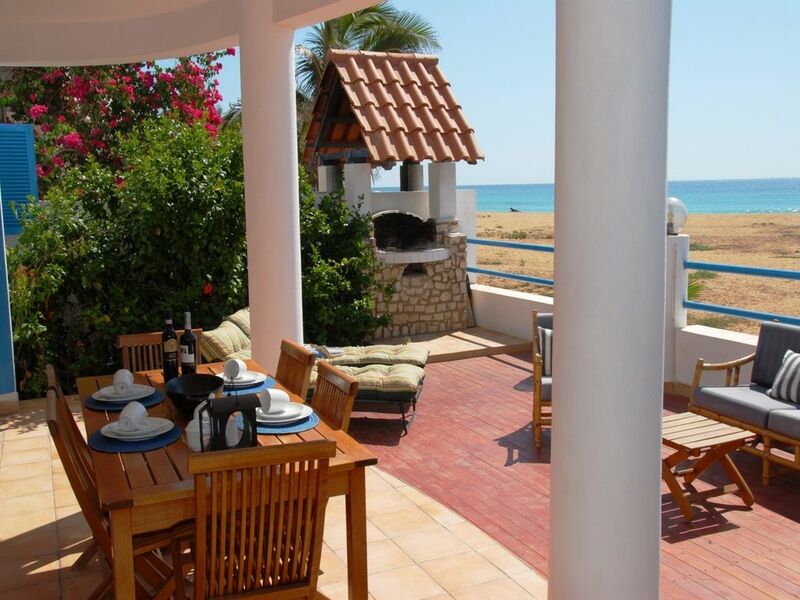 Villa situated on the beach of Santa Maria, close to a windsurf centre and 50m to the sea! Sit virtually on the beach & have breakfast or dine under the stars with nothing but the sea & sand for a view! Only 5 mins walk from Village Centre with supermarkets & markets, bars & shops. Beautifully appointed wood decking & all modern appliances including Air Conditioning. Master bedroom has a fantastic en-suite shower, bidet, sink & WC plus an amazing balcony viewing the beach & the island of Boa Vista. Washing machine, dishwasher, fridge freezer, gas hob, elec cooker etc. Beach garden. Loads to do from Quad trips, fishing, dolphin catamaran trips and unbelievable Scuba Diving. The windsurfing, surfing & kite surfing is world class. We have a superb sailing area in front of the Villa with flat water & great waves on the point. You can sail down toward Pronta Preta to the other point for more waves. The 4 kitesurf and windsurf centers are within 2 mins walk along the beach. Bedroom 1 no longer has a corner bath. At an extra cost of 15 Euros per day. We do ask our guests to replace anything they use as the Villa is used as a family holiday home also. Many thanks for your co-operation. Daily Cleaning Service is offered at 15 Euros per day. There is a final cleaning charge of 28 Euros at the end of the week - this will be paid to Lenise at the end of your stay. Airport transfers are available, 12 Euros during the day and 15 Euros at night, payable locally to the driver. If you need a larger car, these are available at 20 Euros in the day and 25 Euros at night. Please request before travel. The driver will wait in arrivals with your name, destination and flight number on a piece of paper. The villa is in a great location, as in its right on the beach and slightly out of the main busy area but close enough for it not to be a hassle. Also nice and close to Angulos who do great food and nice n cheap. Also - it is NOT a detached villa as described above. The villa is SEMI-DETACHED! not a big deal, but I do prefer an accurate description! Overall a great villa and I would recommend... just be mindful of the things I've mentioned above. Thanks Susan for your comments, we always welcome client constructive feedback. We work very hard to keep the standards high within the villa as it is a family holiday home and carry out a lot of maintenance throughout the year, however the climate is harsh. We re-treat the decking each year, paint and replace furnishings, including missing towels, broken items regularly, however the sun being so strong due to its location to the equator means it is like painting the "forth road bridge" in Scotland, when you finish you need to start again. We do this all in between visits to the villa. The same applies for the cleaning, it's a very sandy location and the wind can be strong, we always have to clean before and after guests as the sand does get into the ground floor. We have supervised our cleaning and it is of a high standard, however we will address these issues with our Manager. Skara the dog, is a family pet who resides at the villa and does have her uses to keeping unwanted people away from the villa. Unfortunately, as with any country there are criminals, we expect any visitors to a country to research it first so not to be too surprised. Cape Verde is in the main, still a third world country and there are friendly residents. We hadn't spotted the description, so naturally we will amend this immediately. Once again, thanks for your comments and we are glad that you enjoyed your stay and liked the villa, many of our guests too have enjoyed the location. What a privilege to stay here. You won’t find a better location. The property is right on the beach with stunning views and to a high standard. How nice to sleep in the master bedroom hearing the sound of the waves crash on the shore when I went to sleep and woke each day. You can lie in bed in the master bedroom with the shutters open and look straight out at the beach and the sea. The master bedroom’s bathroom is huge with a great shower and the same stunning views. The outside furniture is to a high standard with wicker chaise lounge, cane furniture, a wooden dining set and sun loungers. Massimo, the caretaker, was attentive ensuring that everything was working OK and Mawda (phonetically spelt), the guard, was discreet on the evenings I wanted to stay and enjoy the villa. The villa was peaceful yet within an easy 5 minute stroll on a direct route to the centre for food supplies, restaurants, banks and evening entertainment. Free wifi is available in the public square and I had no trouble using my laptop and iPod in this public space (even late at night). I found Cape Verdean people hospitable, friendly, polite and helpful; in particular when I was in difficulty changing my Escudos back to Euros. (I even got a better rate than the bank). Unfortunately for the locals, most tourists stay in their all-inclusive hotels which means that making a living is difficult. However, this means that there are some real bargains to be had if you are up to negotiating. Most items can be bought at 25-33% of the starting price. The weather was sunny everyday with a breeze that stops overheating. Take something warm to wear when walking during the evening as the change in temperature is noticeable outside. The main form of transport for exploring is by Aluger (1 Euro per trip or 100 CVEs) or taxi. I recommend organised trips for seeing some of the off the beaten track attractions like the mirage at Terra Boa and the blue eye at Buracona. The salina is a must. I’m travelled alone and am a 48 year old English female. One word AMAZING ! ! Fantastic house in a great location, a real get away from it all holiday What a luxury to be woken up by the sound of the waves crashing onto the beach,then to lay in bed and look out to sea, after having breakfast on the terrace, stepping out the front gate onto the beach and straight into the beautiful warm and clear turquoise sea.This made it a very relaxed holiday for us and our 3 kids.We all enjoyed the relaxed atmosphere of the location with everything be so close to hand but still with it's own privacy.We were in and out of the sea enjoying the waves then back to the house for a chill on the terrace then off back again ! Having Ninja keep the house clean and tidy each day was a real treat. Massimo was very attentive and even helped us in buying a new suitcase as ours had broken on the outward journey.One phone call and he was there, nothing was any trouble for him! A BIG thankyou to Massimo for organising the boat trip what a special day that turned out to be, a birthday our daughter will remember ! The beach bar/watersports centre near the house was great for breakfast lunch or just beer time, the people were really friendly and helpful.There are also plenty of other good restaurants and bars within easy walking distance. All in all a holiday we all won't forget in a hurry.THANKYOU ! Einkauf, Restaurant, Strand... alles zu Fuss erreichbar. Das Haus ist sehr grosszügig. Einfach eingerichtet aber es fehlt an nichts. Wir würden jederzeit wieder unsere Ferien dort verbringen! Thank you Thomas, we're so glad you enjoyed your stay and hope to welcome you back again in the future! This is an island full of character & culture. It is not commercialised yet although there is a fair amount of development on the west coast of the island. The locals are delighful and the daily catch dragged on to the jetty is an amazing sight, they even cut fresh Tuna steaks for you! Whilst Quad biking we saw a whale breeching recently, about 1km off the beach, clearing the surface crashing down with a huge spalsh. The Cat trip is a great way to see the dolphins. I am told the diving is superb, I can only say windsurfing we see hundreds of flying fish & there is a large amount of fish due to the island being unspoilt. There are a good number of excellent but casual resturants & no shortage of bars & shops. Cape Verde Escudo is the currency but Euros widely accepted. ATM machines are available but credit cards not widely accepted. Please feel free to discuss the Villa or the any aspect of the holiday & we will do our best to help.